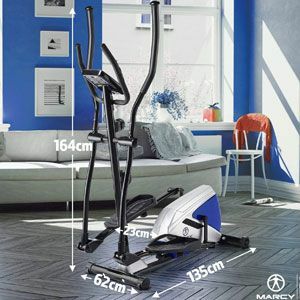 The Marcy Azure EL1016 Cross Trainer looks like a pretty stripped back model with little in the way of a frame, component or any special features. The important basics are definitely there – with the encased flywheel, the footplates, the moving handlebars and the console. But, it really does seems like one of the more minimalist elliptical designs out there. Is there enough going on here to keep users happy, or is it too stripped back? Enough hidden little details to keep users happy. The first benefit to mention here is that frame. 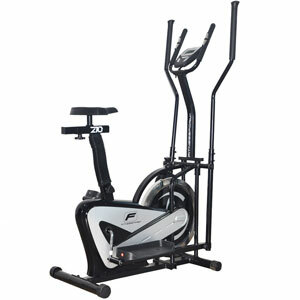 This elliptical machine looks stark and minimal because it uses such a simple, low-rise cut-out frame. This frame means that users can climb on and off without any concern. This is important for those new to this form of exercise, or those with mobility or balance issues. Once on-board, buyers can choose between the eight resistance levels and read the data from the battery-powered console. Also, it should be noted that while the frame seems light and flimsy, there is an 110kg weight allowance. The sales photos of this Marcy cross trainer make it look stripped back, but there are actually plenty of little details and nice elements. There is a flip out stand for a tablet or other mobile device and a water bottle holder to help users with their endurance. There are also nice safety features with the strength of the frame and the grip on the over-sized pedals. The issues with this Marcy Azure EL1016 Elliptical Trainer come from the assembly and build quality. It should be noted that while there are those that praise the build and weight capacity, there are those that struggle with them. There is the sense that this is a reliable machine if it is assembled correctly. The problem here is that many struggle with the process over a long time period. This means that there are some issues with wobbles, joins and squeaks within the mechanisms. Most of these issues aren’t so bad that they become a threat. But, they can be an annoyance. What does this all mean for a final verdict on this Marcy Azure EL1016 Elliptical System? There seem to be two different experiences with this product. On the one hand, there are those that struggle through the assembly process and achieve a machine that doesn’t quite meet all their expectations. On the other, there are those that create something sturdy and easy to use that they can use day after day. This machine may seem minimalistic on first impressions, but there is actually a lot in this design. It has the workout options, comfort features and little conveniences that users want. But, it does so while focusing on the ease of use and shape of the frame. 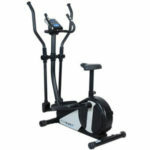 Therefore, this Marcy cross trainer is still a great option for many first-time users. Find more reviews about the Marcy Azure EL1016 Cross Trainer on Amazon here.